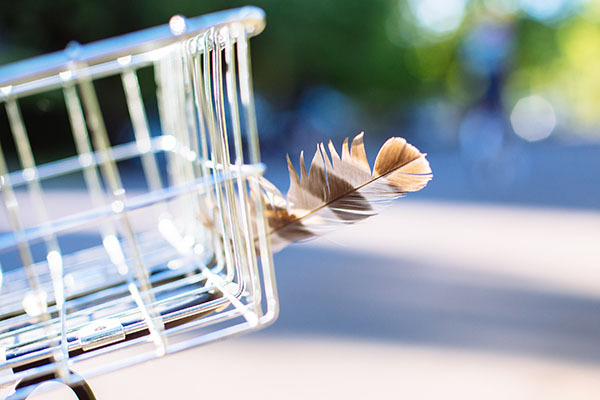 Aqua Dublavee is obsessed with bicycles and the freedom it gives, in all forms. Here, Aqua opens up about being taken seriously as a cyclist, dreaming about biking across America and overcoming doubts while biking and camping alone. Officially, about a year and a half now. I was born and raised in Central Pennsylvania, but moved to Portland from Montana. One of my first memories is being placed into the baby seat on my dad’s bike and riding around town waving to people. Fast forward to teaching myself how to ride on two wheels, getting my beloved 50’s beach cruiser, and then commuting to work. The freedom of the bicycle - in its many variations and applications - is what keeps me obsessed with bicycles. What’s your favorite form of cycling? I really like touring trips, big and small. I love taking the long way home. "The biggest takeaway from that trip, was being able to shut up that little voice in my head that kept telling me to stop and turn around to end the trip." Do you have a favorite bike shop? If so, who is it? If not, what’s lacking? Glady’s Bikes and all of the wonderful humans involved with that store! Being genuinely welcomed into a store is a wonderful feeling. Being able to talk to someone without receiving eye rolls or stinky attitude is great as well. Ultimately, my goal is to visit all of the bike shops in town, mainly just for the geek factor. Favorite place to ride in the Portland area? Riding from the North East area of Portland to the inner South East area has some of the more tree lined routes that I love to ride through. My favorite ride is my solo overnight trip out to L.L. Stub Stewart State Park. The scenic, quiet roads were amazing to ride on. The biggest takeaway from that trip, was being able to shut up that little voice in my head that kept telling me to stop and turn around to end the trip. I pressed on, completed the entire ride, and felt wonderful the entire time! I didn’t think it was possible but, this trip helped me love cycling even more. What are some of your cycling goals? My biggest goal right now is to build up my average speed and overall endurance so I can do longer mile rides - either solo or with a group. My life goal is to ride and complete the ACA TransAmerica Trail. Until then, I want to ride every nook and cranny that this nation of ours has to offer. 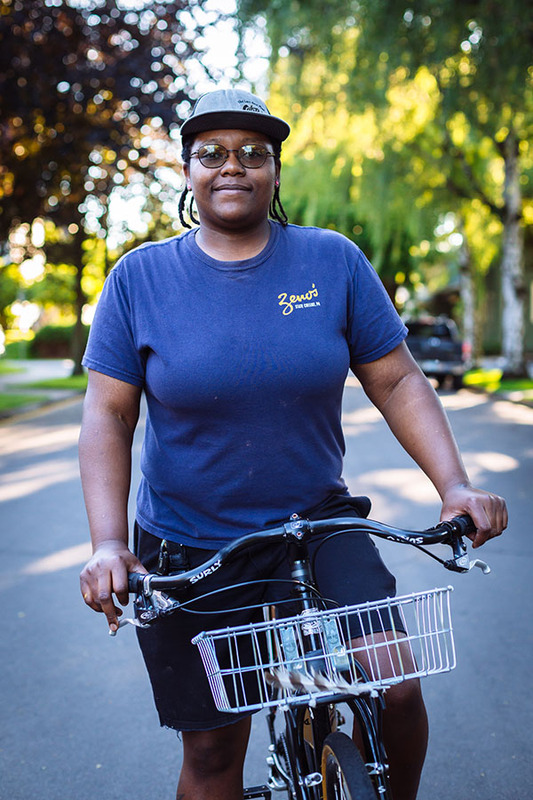 "Because I am full bodied and a woman, sometimes when I walk into bike shops, I can see that the people there think I’m just going to wander around the store, not know anything about anything, and then leave without buying anything." Are there any challenges you’ve faced as a cyclist? The only negativity I face is not being taken seriously as a cyclist. Because I am full bodied and a woman, sometimes when I walk into bike shops, I can see that the people there think I’m just going to wander around the store, not know anything about anything, and then leave without buying anything. One of my favorite things about the Portland cycling culture is there are so many bike shops here, it’s easier to find a shop that doesn’t make me feel like this. 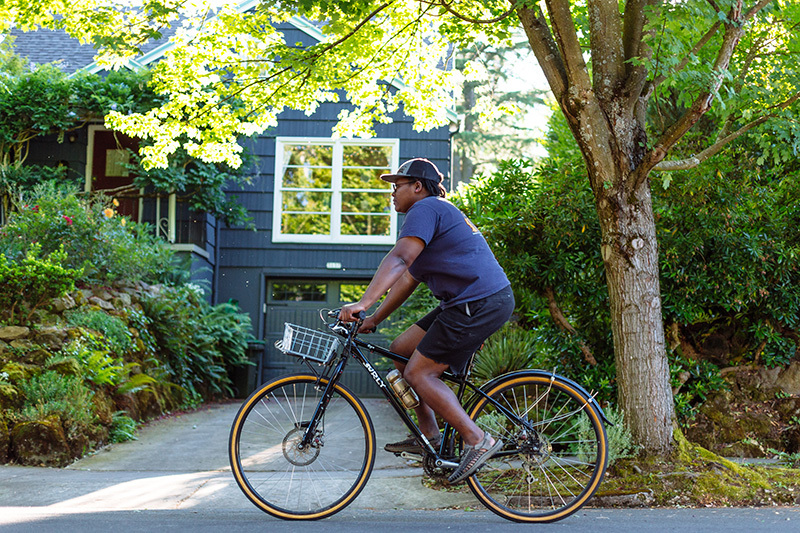 Luckily since I’ve moved to Portland, I don’t feel that negativity on bike rides or bikey social events because of my gender or outward appearance. 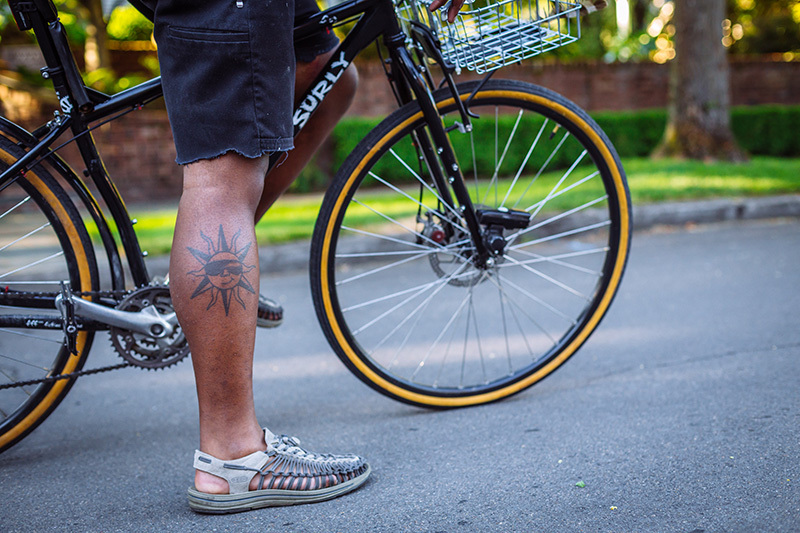 What/who inspires you to bike? What gets you pedalling? The bikey people I’ve met throughout my life help fuel my bicycle addiction. I moved to Portland specifically for its cycling culture and it has yet to disappoint! I love how I am meeting people from every subculture of cycling and trying out new types of rides helps keep me pedalling. "Just like anywhere I’ve been, people always have preconceived notions of how I will talk, act, or believe... Dear world, don’t judge a book by it’s cover!" 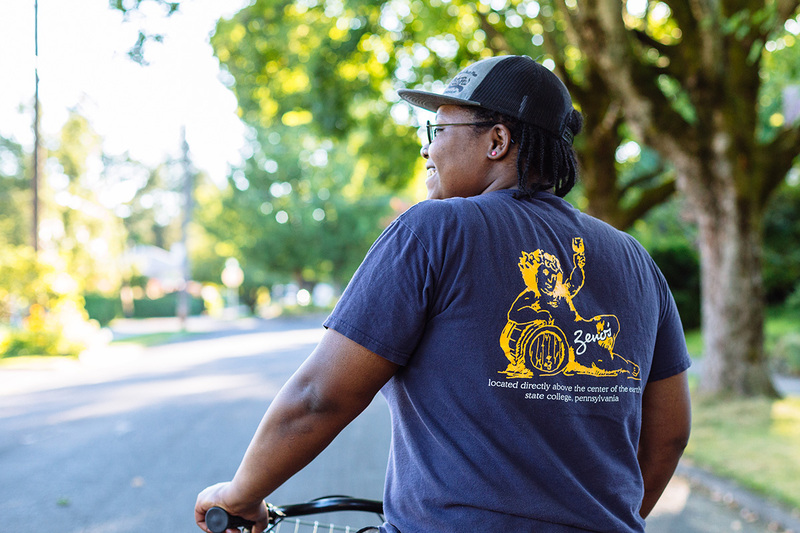 Describe your experience as a WOC here in Portland, both on the bike and off. Just like anywhere I’ve been, people always have preconceived notions of how I will talk, act, or believe. I love to see the looks on their faces when nothing they thought would happen happens. Dear world, don’t judge a book by it’s cover! I will say however that everyone I’ve met here in Portland seems to have a shorter list and gets over it faster. Do you have a lot of POC friends who bike? 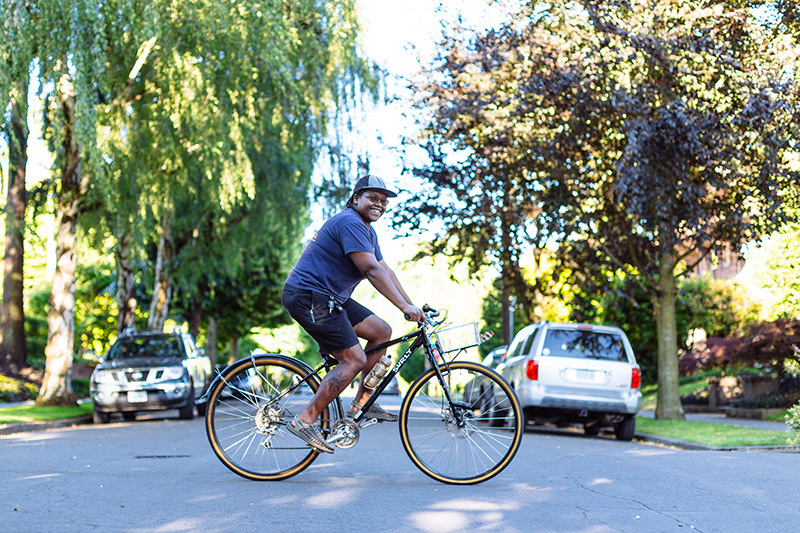 I personally feel like the cycling scene in Portland is more diverse than people think it is. It all depends on the variety of rides you go to! How can we get more WOC to bike? I believe the outlets for WOC are out there, there just needs to be more advertising and gathering of user feedback. Also events spread out to different days of the week would help with any scheduling difficulties. I know one of my biggest obstacles to getting out to rides or other social events, is how most events are only on Saturdays or Sundays, only mornings, or only nights. Shake it up a bit Portland! Can't leave the house without: My bicycle - I regret it every time I do. Favorite Insta: I don't have a specific account I favor most. I love the accounts that showcase bicycle adventures. Favorite donut: Old Fashion with strawberry glaze.